I was overdue for an avalanche skills refresher, and Haidee had read most of one thick tome about avalanches, so we signed up for one of Paddle Club's one-day avalanche skills courses. 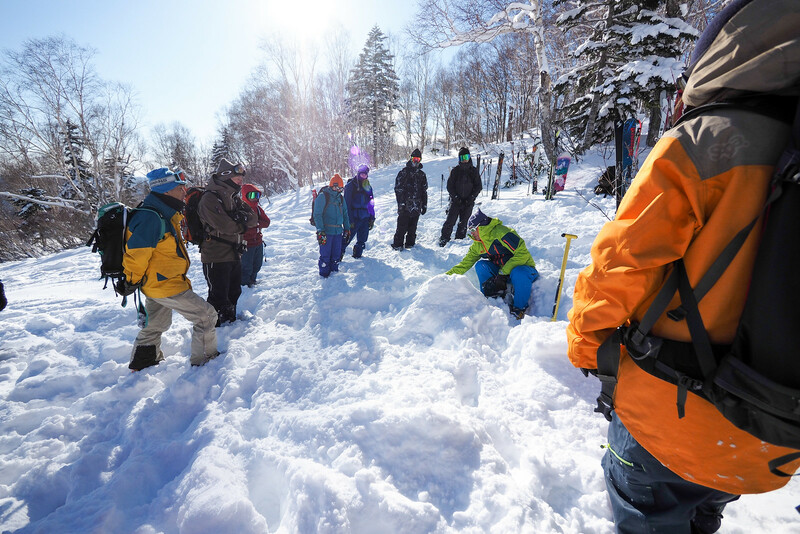 Led by Nomad Guides' Takao Miyashita, it is a great course for anyone with some existing knowledge who wants to get some more hands-on experience with post-avalanche rescue. 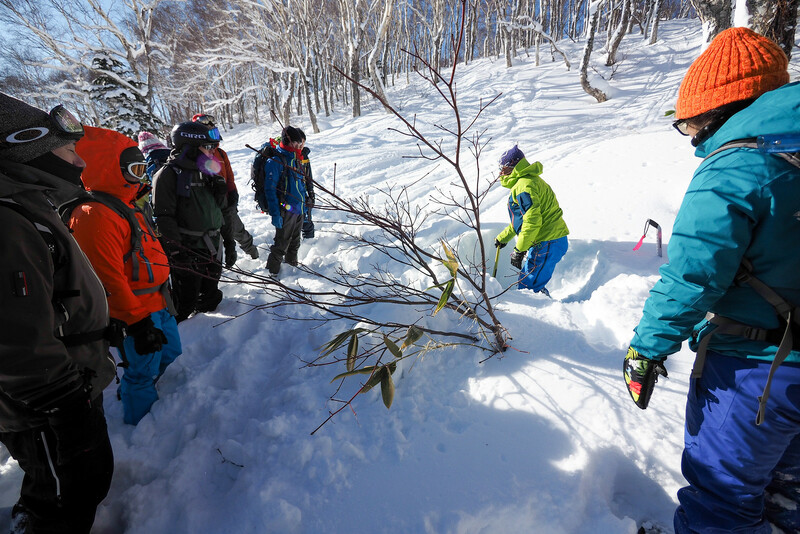 Beware that it's all in Japanese, and, being just a day-long course, is thin on theory regarding avalanche avoidance and travel in the backcountry. That said, it was great to be taught by such an experienced alpine guide! 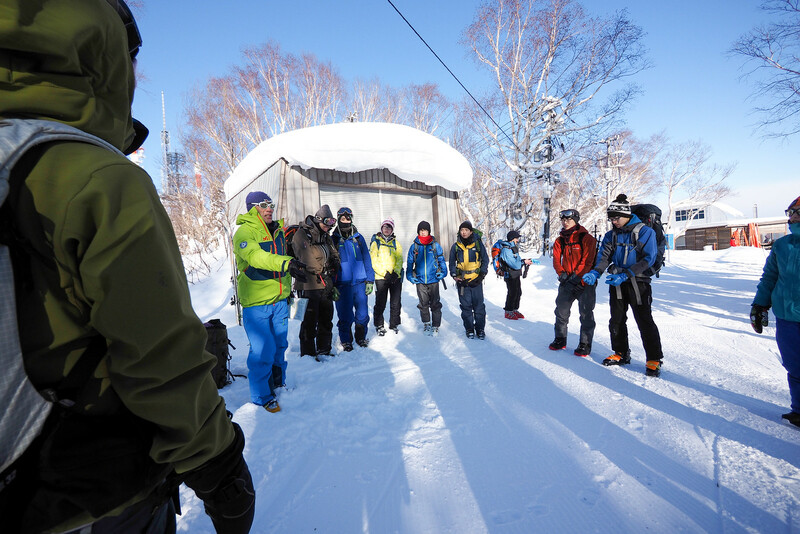 The last time I did an avalanche safety course was with Whiteroom Tours in Niseko, back in December 2015 (report here). That was a full two-day course, which included half a day of theory and one-and-a-half days of hands-on training. As someone who had never even read much about avalanche safety, it was a solid introduction. This year, we were looking for a short course close to home, so that Haidee could get some hands-on experience, and I could brush up on my skills. 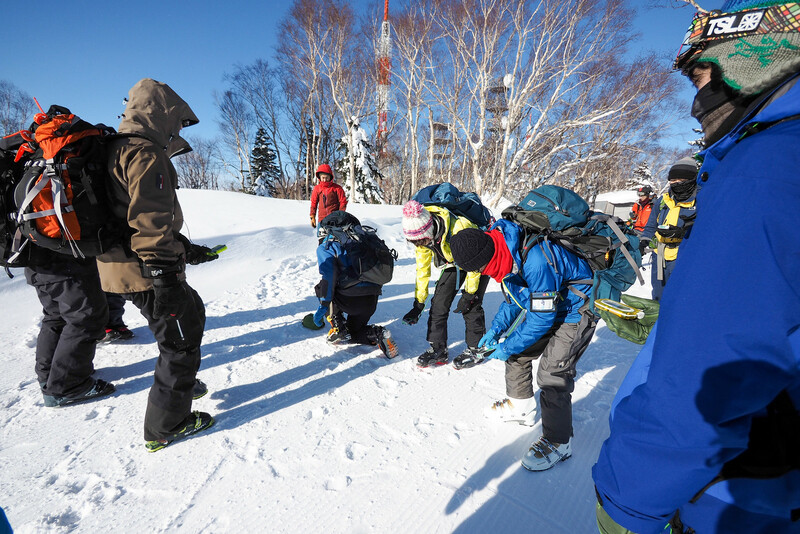 Generally, shorter avalanche safety courses (i.e., less than two days) in Hokkaido appear to be primarily offered in Japanese by local mountain safety associations and outdoor stores. 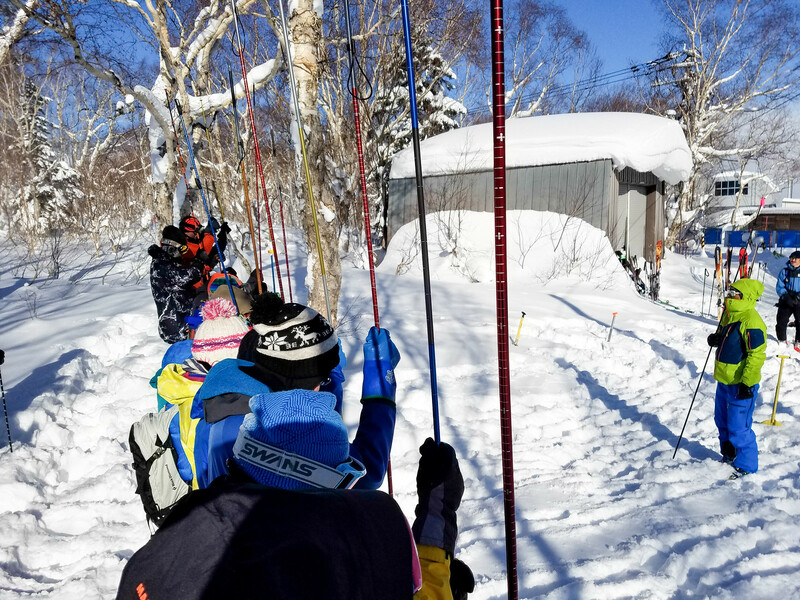 A quick web search sent us to courses offered by Paddle Club, one of the two larger outdoor stores in Sapporo. Their store at the southern end of Sapporo (here) happens to be just across the road from where we work, so it was an easy process to visit the store to sign up. We both speak Japanese reasonably well, so were not fazed with the prospect of doing the course in Japanese. So we signed up to a course on Sunday the 17th of December, 2017, to be held at the Teine Highland Ski Area (here). 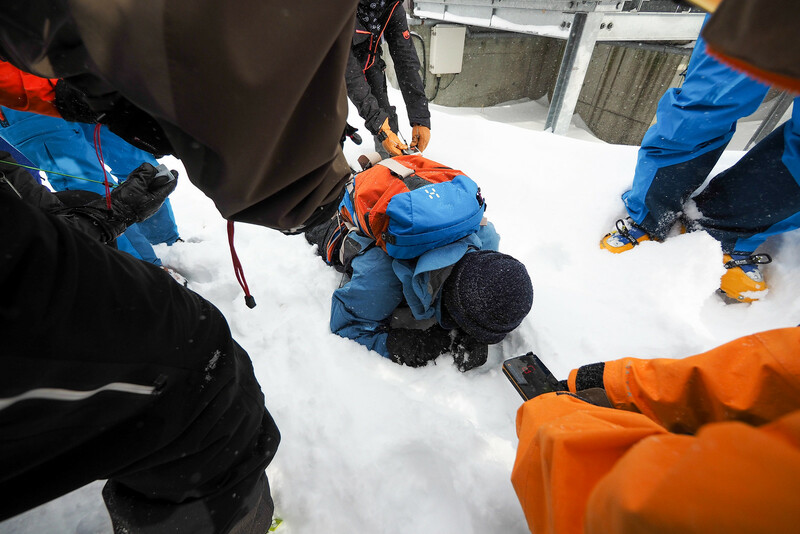 Cost was 7,000yen each (not including lift tickets) for the 9am to 3pm course. 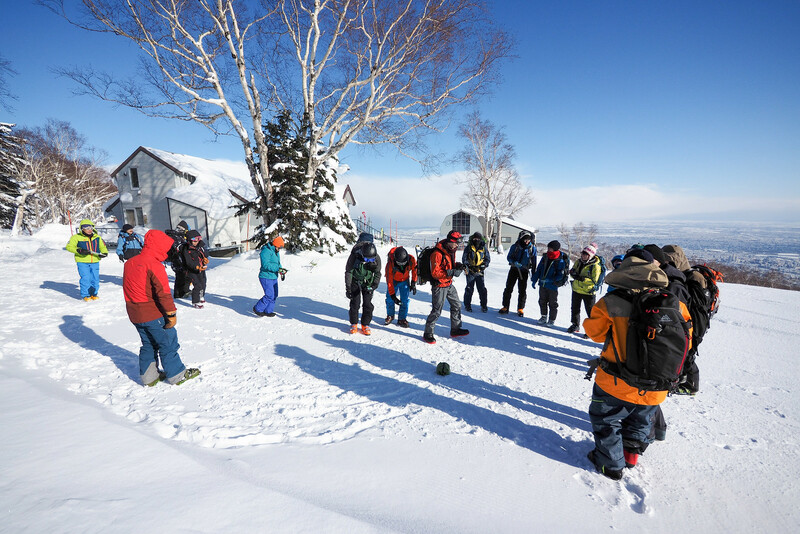 This early-winter course was just one offered by apline guide Takao Miyashita (website). 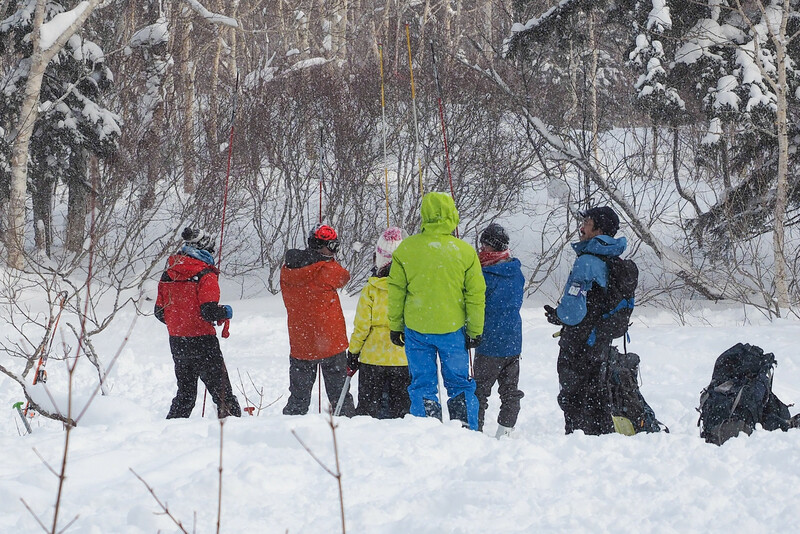 This year for the 2017/2018 season, he is offering a number of courses in backcountry skills (pdf). It was hard to fault his credentials: Multiple 6,500m+ summits, Accredited International Alpine Guide, Japan Alpine Guide Association International Guide Examiner, Chairman of the Board of Directors of the Hokkaido Alpine Guide Association, Hokkaido Snow Damage Research Team Member (the group that publishes the Sangaku Nadare Daizen (Corpus of Alpine Avalanches; Seppyou saigai chousa chiimu, 2015))…I was sold. On the day, we arrived at Teine Highland about 15 minutes before the start of the course. All up there were about 20 participants. 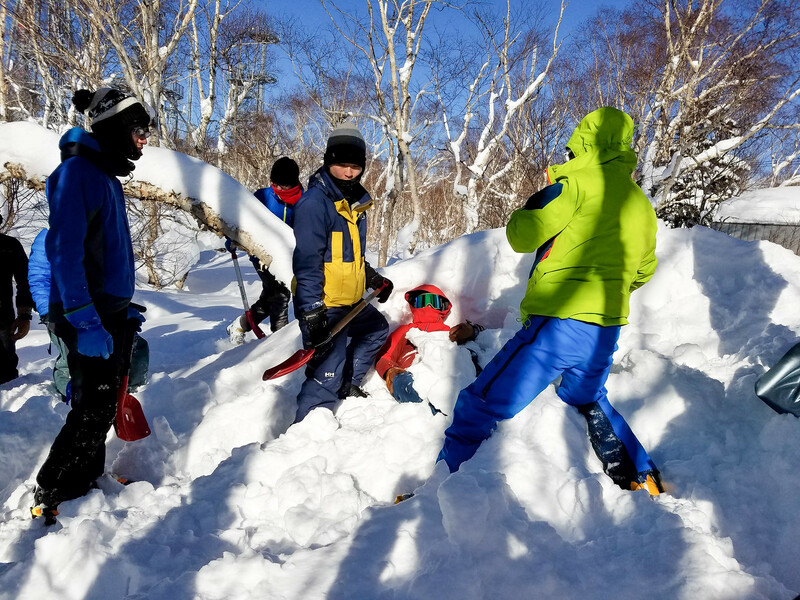 Most appeared to be new to avalanche safety, so after a quick check to make sure everyone knew how to turn their beacons on, we took the lift up to the summit of Mt. Teine. 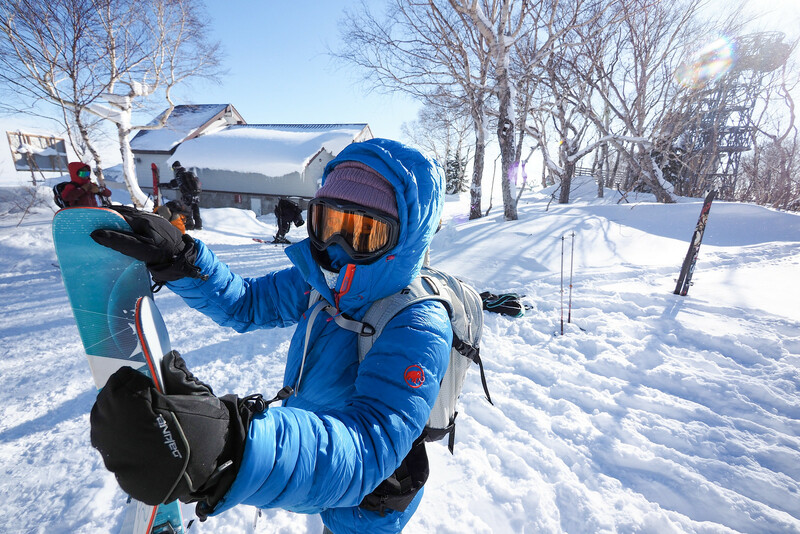 Whereas in the earlier days they’d enjoy the winter mountains on skis by taking very conservative routes along ridges, Miyashita says nowadays, with fat-ski technology and other advances, people are being drawn to more risky wide open runs in avalanche terrain. 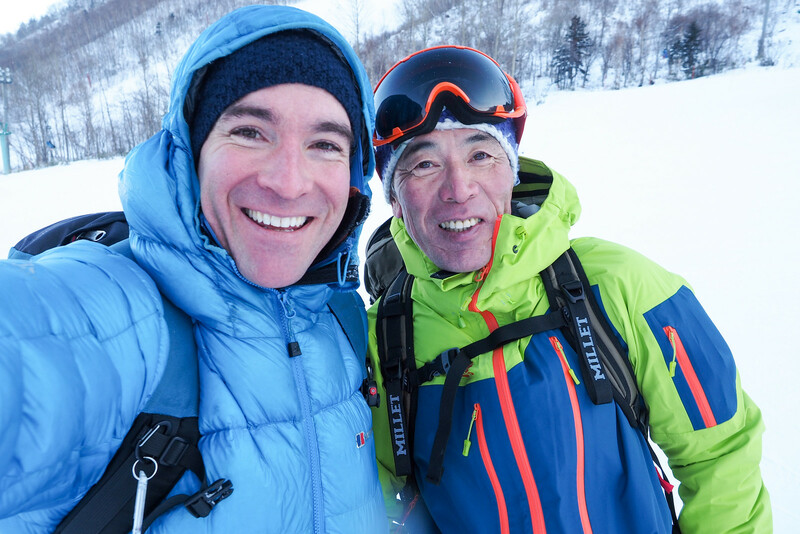 With Miyashita’s personal experience still reverberating in our heads, we dove into the basics of avalanche search and rescue. Beacons sending and receiving signals, checking beacon functionality before setting off etc. 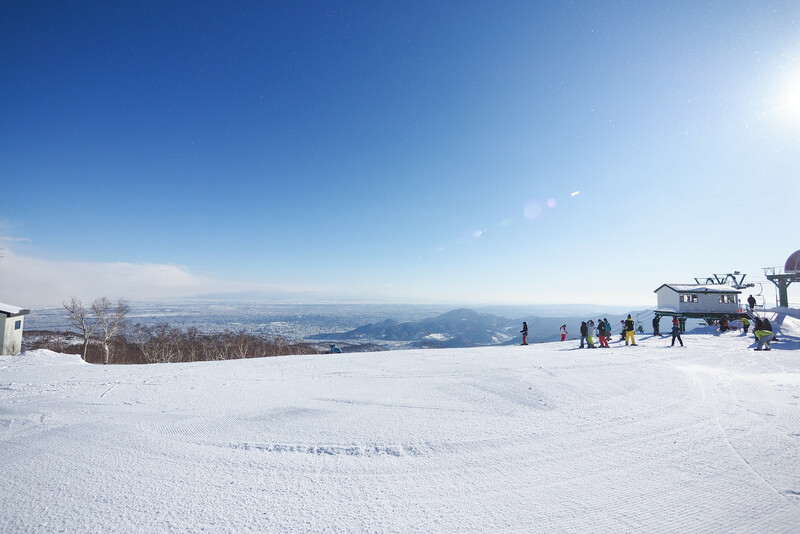 At this stage, it was glorious weather, with massive views across Sapporo City. We then went over how to use our probes (remembering to lock them), and how to dig (teams of three, one person behind the other). After this hands-on overview, we skied down to an off-piste area to touch briefly on how to test for weak layers in the snowpack. It was quite windy and cold at the summit, so I think we were all happy to get a little lower down to a more sheltered wooded area. While most of what we’d done to this point was revision for me, I was happy to learn something new at this point in the course: the hand-test. This consisted of burrowing out a cylindrical column of snow with your hand, and then pulling on it with increasing force. Much quicker than a full snow pit and column test, this was a neat trick to try out. By now it was just before noon, so we finished the morning session here, and all headed down to the ski area buildings for lunch. After a quick lunch, we were back up to the summit for the afternoon session just before 1pm. First up in the afternoon session was tactics for searching for multiple burials. Miyashita’s assistants (staff from Paddle Club) were willing volunteers for the task. We then headed back to the previous off-piste location, and while the group was not watching, the staff buried three rucksacks: two with operating beacons, and one with no beacon. 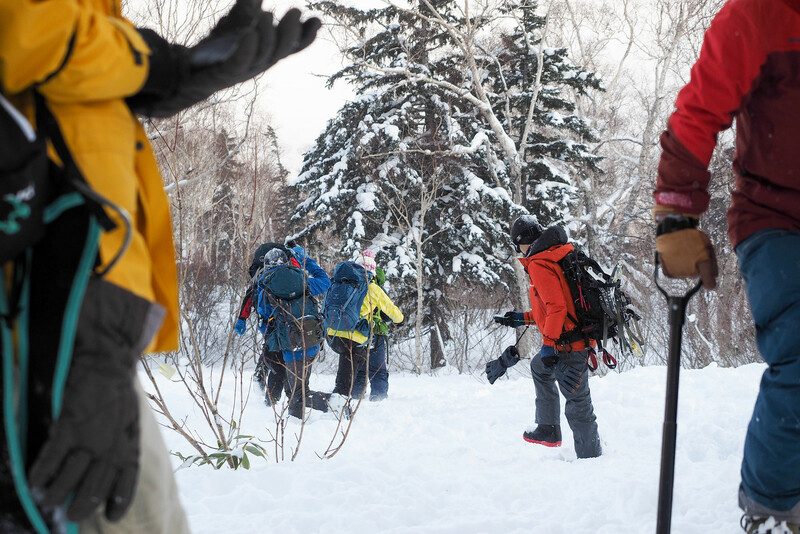 The group was split into three groups, and each took turns trying to find the buried rucksacks. The group that Haidee and I was in drew the short straw and was first up. It took us 17 minutes to find all three rucksacks. By then, the one without a beacon, had it been a human, would have had only around a 40% chance of being alive (Tremper, 2008). As the other teams did their turns, we all watched and hopefully learned something from their mistakes. The day’s course wrapped up after a brief de-briefing by Miyashita. As Haidee and I drove back to our place from the ski field, we reflected on what we thought of the course. I think the following sums it up. The course is great for: – People who have done a more intensive course and want their annual refresher. 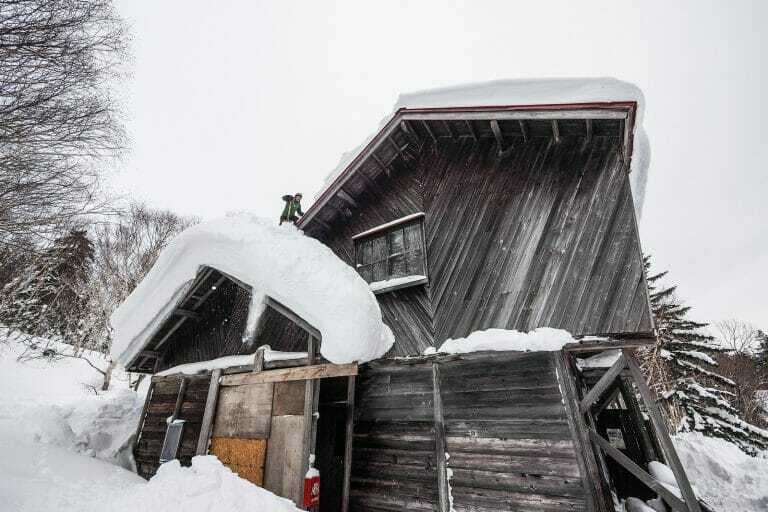 – People who have read an introductory book on avalanche safety (such as Tremper (2013) or Tremper (2008)), and want some hands-on experience with their rescue equipment. – People who have little experience, and just want to get some confidence in using their rescue equipment. The course is not so great for: People who want some in depth tuition on avalanche safety theory, including avalanche avoidance. E.g., route selection, snow pack mechanisms etc. To sum it all up, we felt like this course is best paired with lectures and/or reading on avalanche safety theory. There’s only so much that can be covered in a short one day course, so I would recommend it as part of a wider effort to upskill oneself for the winter hills. One thing Haidee and I were both very impressed by was the way in which Takao Miyashita injected real-world experience and stories into the course. It is a rare thing to be in the presence of someone so experienced. Many thanks Takao! Seppyou saigai chousa chiimu. (2015). 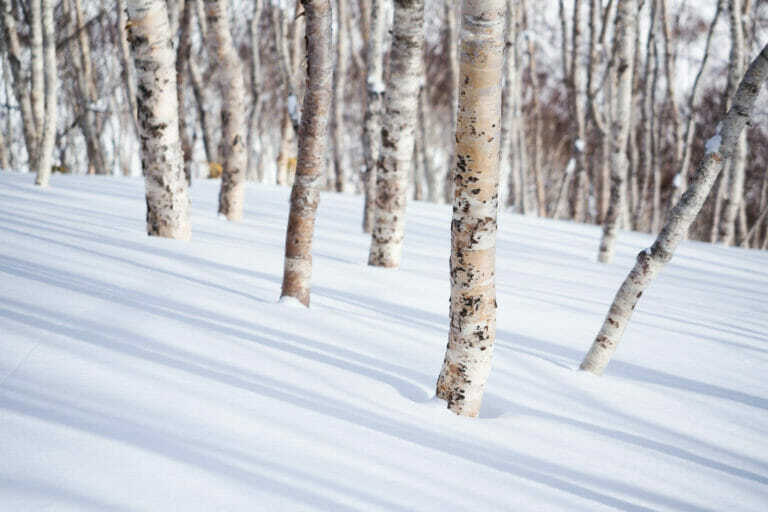 Sangaku nadare daizen [Corpus on Alpine Avalanches (in Japanese)]. Yamakei to Keikoku: Tokyo. Tremper, B. (2013). 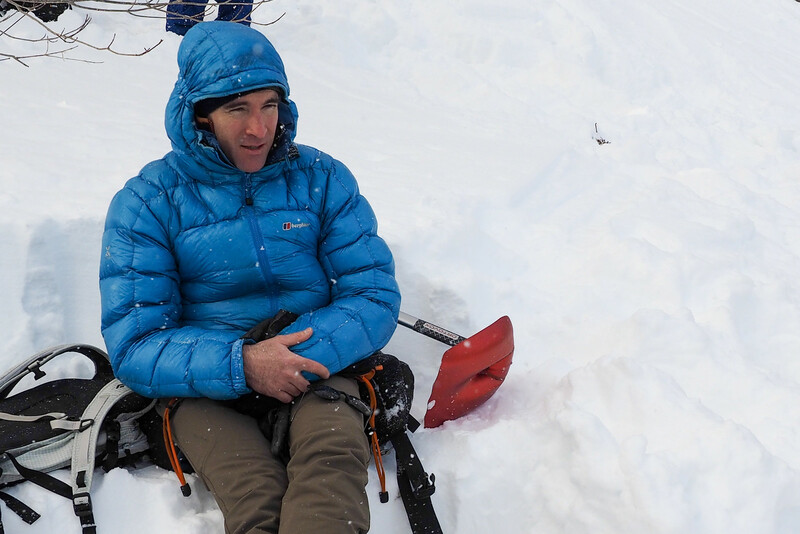 Avalanche Essentials: A step-by-step System for Safety and Survival. Mountaineers Books: WA, USA. Tremper, B. (2008). Staying Alive In Avalanche Terrain. The Mountaineers Books: WA, USA.